This is my attempt to recreate those huge, chewy cookies they serve at Starbucks. If you have ever had one, you'll know exactly what I'm talking about. Doesn't it look good? 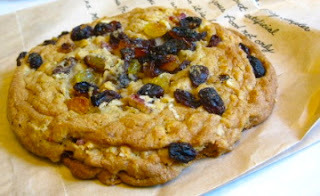 In an attempt to make them healthier, I changed the all purpose flour in the original recipe to whole wheat, then added the golden raisins and dried cranberries like the cookies at Starbucks. The recipe was originally named 'disappearing oatmeal cookies' by my mom's friend, Peggy. Whenever I make them, they quickly disappear, so I guess there is truth in advertising. Drop by teaspoonfuls onto an ungreased cookie sheet. Bake 10-12 minutes or until golden brown. Cool on wire rack. Store in an airtight container. Recipe makes approximately 4 dozen cookies.